We can accommodate School, Duke of Edinburgh's Award groups or other large camping parties by arrangement. 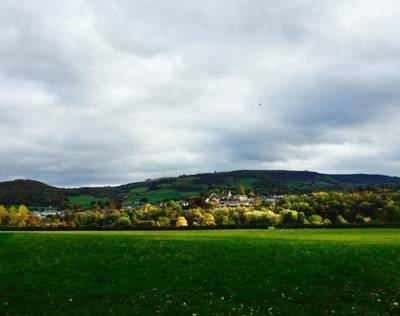 The views from Racquety Farm are excellent and although you will be in the countryside, the campsite is only a short walk from the charming town centre of Hay. The site boasts private access to the nearby River Wye with exclusive rights for game and coarse fishing and a canoe launch/landing point. There's a canoe hire company sited a short walk from the site, whilst fresh, seasonal fruit and veg is often available to buy as well as basic supplies like tea, coffee, sugar, milk, bacon and eggs. This 60-pitch campsite is a 'Soil Association' certificated organic farm comprised of arable pasture, orchards and woodland and the sites tranquil river bank is an SSSI (Site of Special Scientific Interest). There are 6 compost loos, 5 hot gas-powered showers and good re-cycling facilities. Braziers available for campfires (fires not permitted on the ground) and firewood is available to buy. Geodesic domes are fully carpeted and feature beds and bedding, wood-burning stove and fuel, electric lighting and socket. Direct access to the river for canoeing or fishing. Licences and permission can be obtained for fishing via the campsite or The Wye and Usk Foundation. The river bank is an SSSI, so the owners are careful to manage the numbers of people accessing the river bank at one time. The Wye is a popular river for 'wild swimmers'. Geodesic domes and 1 shepherds Hut – the biggest sleeping up to 8 people – plus 3 rooms in the B&B and 60 undesignated camping pitches, plus a few gravel areas for campervans. Shepherds Hut from £60 per night Domes from £135 per night (both 2 night minimum). Camping: £8–£15 per person per night. Children (aged 5–15) half price. Under 5s free. From the East: Use the M4 to Newport then take A4042 to Abergavenny then A40 to Crickhowell. Approximately 2 miles outside Crockhowell take right turn to Talgarth using A479 (over the mountain). From Talgarth take A4078 towards Hay-on-Wye. Take A438 (signed Hereford) through Glasbury and Llowes and when you hit Clyro Village look for right hand turn to Hay-on-Wye. Follow road for approx 3/4 mile and take right turn into either campsite 1 or 2 at Racquety Farm (depending upon your booking arrangements). From Cardiff or the West use A470 or A40 to Brecon and then take the road towards Hereford following A438 (signed Hereford) through Glasbury and Llowes, following the same directions as above. The closest train station, approaching from England is in the city of Hereford (0845 748 4950), approximately 22 miles east of Hay-on-Wye. Stagecoach buses then run from Hereford to Brecon (via Hay-on-Wye). Booths Bookshop (01497 820322) in town has a very nice restaurant and a cinema showing movies or live screenings of cultural events.